Description: After a major dumping of the white stuff a two unit Plow Extra is southbound out of Worcester Ma. Description: Southbound after close to a two foot dumping of the white stuff. Description: CT-1 is heading back to Cedar Hill. 3902 brings up the rear. Description: 3907 and 2208 cross Tamarac Swamp Rd trestle. Description: CT-1 climbs the hill near Middlefield depot. Description: No emptys were available at Hartford for today's train shown just north of CT rte. 3 crossing. Description: PW 3907 leads train CT-1 northbound across the Middletown Diamond. The train will switch the Mattabassett Water Treatment plant in Cromwell before returing to the Cedar Hill Yard in New Haven. That coil car is an empty from Primary Steel. Description: PW train CT-1X prepares to head north to Hartford to interchange with Connecticut Southern train CSO-3. Description: PW 3907 and PW 3901 arrive at the CSOR interchange with train CT-1X at Hartford. Description: CT-1X works the PW/Connecticut Southern interchange in Hartford as a few of CSO-3's cars look on in the background. Description: Backing on to the bridge track, preparing to cross over to Portland, CT with some empty trash gondolas. Description: Gondolas dropped off, heading back over the Connecticut River to Middletown, CT... must be a fun ride. Description: PW 5001 looks on as PW 3907 switches the Middletown Sewer Department. Description: PW 3907, one of the units on today's CT-1X, had a small fire and had to be left in Middletown to be picked up by train CT-1. Description: PW 3907 is the trailing unit on train CT-1 as the train crosses West Street in Middlefield. 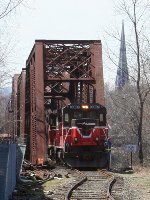 The train will switch Tilcon in Wallingford, and then run to the Cedar Hill Yard in New Haven. Description: PW 3907, the rear unit on train CT-1, passes the Country Depot Antiques building, as the train heads north for Middletown and Portland. Description: PW 3907 leads train CT-1 past Country Depot Antiques and across West Street. The train will switch Tilcon in Wallingford and then run to the Cedar Hill Yard. Description: PW 3907 was the rear unit on northbound train CT-1. It is now going to switch the Mattabassett Water Treatment plant, while the rest of the train (the end of which can be seen to the right of 3907) goes across the Connecticut River to switch Smurfit-Stone Container and Murphy Road Recycling. Description: CT-1's crew has just split in two---at this point, 3907 will remain in Middletown for refueling while the rest of the train crosses the diamond and heads for the Portland side of the Connecticut River. Description: PW 3907 leads southbound train CT-1 past the small antique store, on the way to the Tilcon quarry in Wallingford, then the Cedar Hill yard in North Haven. The siding farthest off to the right is the Dyno siding, where CT-1 will be making a pick up, before proceeding to Tilcon and Cedar Hill. Description: PW 3907 leads train CT-1X southbound toward the Cedar Hill Yard after picking up loaded stone hoppers from the Tilcon quarry. Description: PW 3907 leads train CT-1X southbound with thirty five loads of stone just after departing the Tilcon quarry. In New Haven, the train will be handed over to the crew of CT-2X, which will take it to Danbury. Description: PW 3907 leads train CT-1 southbound across West Street. Description: PW 3907 leads train CT-1 southbound toward the Tilcon quarry and then the Cedar Hill yard.